Tim Whatley is a recurring character played by Brian Cranston and is referred to by George as the “dentist to the stars”. 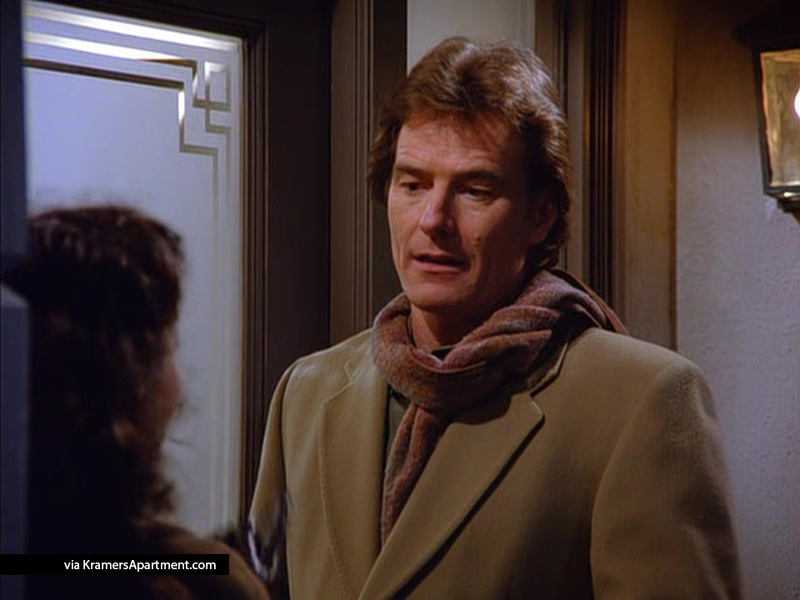 Tim is a Manhattan socialite and throws several parties at his big apartment on 77th St.
Over the course of several episodes, Tim Whatley is involved in storylines with all four main characters on the show and dates Elaine for a brief period. 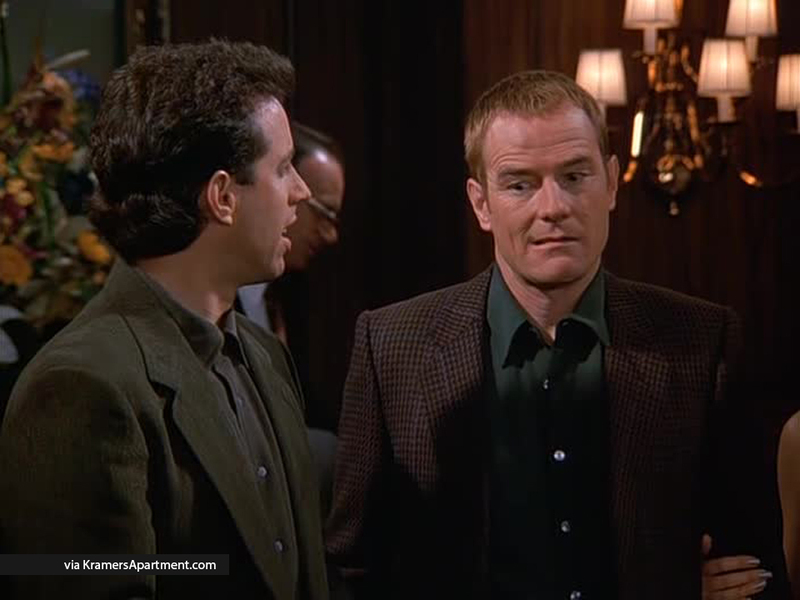 Tim converts to Judaism and begins telling Jewish jokes, which causes Jerry to accuses him of converting only for total joke telling immunity. Jerry is unsure if he is invited to Tim’s party based on Tim’s response to Elaine. George takes a pencil to the party because he thinks he can ask one of the many dentists at the party if they can compare the teeth marks on a pencil he found in his new car to see if Jon Voight was really the previous owner. Tim was labeled as a re-gifter when he gives a label maker to Jerry as a gift for giving him his Super Bowl tickets. Elaine realizes that it’s the same label maker she had given to him as a gift after he didn’t charge her for dental work. Tim decides to put Penthouse magazines in his waiting room and adopts an adults-only policy. Kramer, who is also a patient, supports the new policy now that he can let the expletives fly. Jerry is suspicious that Tim was violating him sexually while he was under the gas, but hey at least he’s single. Tim converts to Judaism, and Jerry thinks the only reason he did this was solely for the jokes. The idea of a fake conversion offends him, not as a Jewish person, but as a comedian. 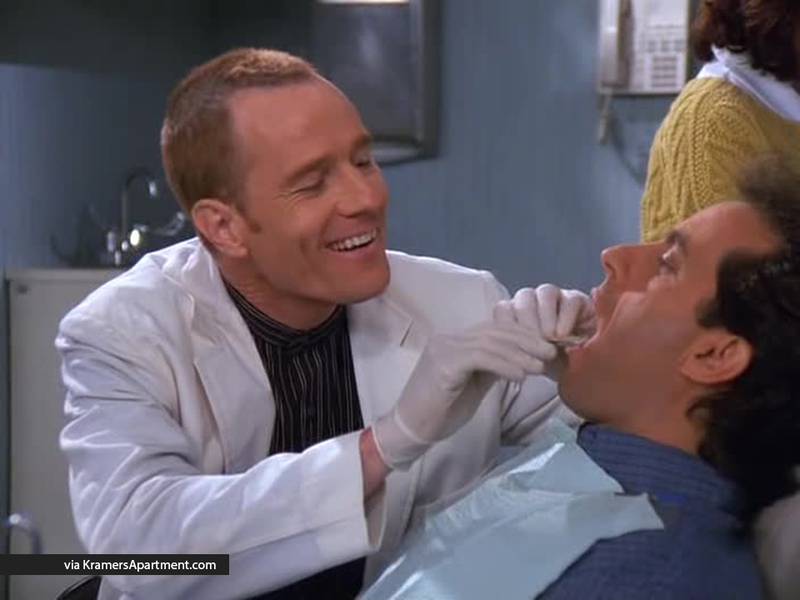 Tim takes exception to a joke that Jerry tells to a priest and makes his next visit to the dentist a rough experience. Kramer accuses Jerry of being an anti-dentite because of the joke. Tim hands out cards for a Christmas gift that are donations made in his friend’s names to a charity. George admires the strategy and creates a fake charity called The Human Fund, to give fake Christmas gifts at work. At Tim’s party, Jerry meets Gwen who is a two-face or someone who looks very good in some environments, but not so much in others. Tim: Jerry. I didn’t think you’d show. Jerry: Did you say, “Jerry, I didn’t think you’d show” or, “Jerry, I didn’t think you’d show”? Tim: Well. I’m really glad you came. Tim: Really glad you came. Tim: (picks up a bowl of nuts): Listen, Elaine, I’ve been wanting to ask you…would you like to go out with me New Years Eve? Thanks. Tim: That’s John Voight’s pencil? George: That’s right. I got his whole car downstairs. Tim: Are you the one who bought his LeBaron convertible? George: Yes! Yes, I’m the one! Hey! So, you know Jon Voight! Tim: Yes! Yes, I went to dental school with him. George: Jon Voight, the actor? Kramer: Oh! You popped Woody Woodpecker! Tim: Hey, who invited you, anyway? You’re a troublemaker! Tim: Well, this is my building. Tim: This was fun, you know? Elaine: Aren’t you gonna invite me upstairs? Tim: Upstairs? You wanna go upstairs? Elaine: I would love to go upstairs. Tim: Elaine, you are something else. No one can ever put a label on you, huh? Elaine: I’ve got a confession to make. Elaine: I’ve got Super Bowl fever. Tim: Oh yeah, me too. Elaine: So where are we staying? Tim: It’s a regular room, but it’s right downtown. Elaine: What do they have there, a couple of beds? Tim: Why? You bringing someone else? Elaine: No, but don’t you think there should be two beds? There’s two of us. Tim: Ah, see, now I’ve been thinking a lot about what happened and I feel horrible. Listen, I want to give you a ticket back. Jerry: Are you serious, what about Elaine? Tim: Oh, Elaine. Yeah, well, things just didn’t work out like I thought they would. Elaine: Don’t worry, Tim. I didn’t come by to yell at you, I didn’t come by for that at all. I just came by to pick up my label maker. I gave you a label maker and now I would like to have it back. Tim: But you gave it to me. Elaine: But you gave me a ticket to the Super Bowl. Hand it over, Whatley. Elaine: You don’t have the label maker, do you? Elaine: I knew it! You’re a regifter! Tim: Oh, yeah, some gift. That thing didn’t work at all. Tim: You put a label on something, then ten minutes later it would peel right off. It was the worst gift I ever got. Elaine: Well, I bought it for you because you were so nice to me for not charging me for the dental work. The way you worked on my filling, you were so, so gentle and so caring and so sensitive. Kramer: Boy, you’re looking sharp there Tim. Tim: Yeah Well…I do what I can. How’ve you been? Kramer: Euh… Fine, good, yeah! Just been occupying myself with some of your…hem reading material. Tim: So what’ill it be? Novocaine? Kramer: Oh yes, yes indeed. Tim: Why don’t we just clear a path first. Kramer: yeah, yeah, let’s do that. Tim: You remember Mr. Thirsty. Tim: Sheryl, would you ready the Nitous, please? Whatley inhales the gas mask before handing it over to Jerry. Jerry: Oh! where’s Jennifer today? Tim: I’ll tell you what’s up. I’m a Jew. Tim: I’m a Jew. I finished converting two days ago. Tim: Oh, well, I didn’t do much. I just sat in the sauna. You know, it was more like a Jewish workout. I’ll see ya. Tim: All right, it is cavity time. Ah, here we go. Which reminds me, did you hear the one about the rabbi and the farmer’s daughter? Huh? Tim: Those aren’t matzah balls. Tim: Why not? I’m Jewish, remember? Tim: Jerry, it’s our sense of humor that sustained us as a people for 3000 years. Tim: 5000, even better. Okay, Chrissie. Give me a schtickle of fluoride. Tim: I’m just getting warmed up. Because I’m just a sadist with newer magazines. Jerry: Hey, Tim. Great party. Tim: Oh. Hey, George, thanks again for getting me those Yankee tickets. George: Oh, yeah. Still in good with the ground crew. Tim: Oh, hey, listen, I’d better circulate… Happy Chanukah, Tiffany! Elaine: This place is like Studio 54 with a menorah. Jerry: Actually, I’m having dinner with a girl I met at your party.